Little Amy (Dharbi Jens) has an imaginary friend and is the cutest little kid, until she shows up missing one night. Her parents Sarah (Teri Polo) and Gavin (Brett Baker), who are having all kinds of relationship problems, are obviously distraught but Sarah’s brother (Dermot Mulroney) is the Chief of Police and as Chief he beckons his chief child finder in damaged detective John Koski (John Voight) to get on the job. And eventually a physic named Farley Connors (Julian Morris) will be summoned because an imaginary friend in a movie like this is rarely just some kids imaginary friend. If the setup for this supernatural thriller ‘Beyond’ sounds a little generic it’s because it is completely generic, but that doesn’t make ‘Beyond’ a bad film, just one that does little to separate itself from the many similar types of movies that has come before it. One thing we know that if Detective Koski finds this kidnapper that guy is in trouble because we’ve already seen Koski execute one child kidnapper in the film’s opening scene. You know the story: Back in the day there was the one kid, the one case, the one he was never able to solve and it’s been haunting him ever since, which is why he has very little sympathy for perps who abduct children. Regardless, Koski is weeding through the facts of the case and narrowing down his suspects. Could it be the parents since the dad is reported as having financial difficulties, or maybe it’s one of dad’s old cases since he used to be a prosecuting attorney in a previous life, or it could be the deliciously slutty babysitter (Skyler Shaye) who doesn’t seem to like the mom all that much, even though she’s constantly hanging around the house even though the kid is all kidnapped and stuff. Eventually Koski will have another suspect in Farley the Psychic since he tends to show up completely unannounced, armed with critical knowledge about the case. Stuff he could only know if he was either involved in the abduction, or in the unlikely event that he’s a psychic for real. Since Koski doesn’t believe in that stuff, Farley is a prime suspect in his book. Suspect or not, eventually the grizzled cop and the psychic with the weak stomach are going to have to start piecing together what they know because time is running out, a little girls life is at stake and… of course… nothing is quite what it seems. Prepare to be surprised. Or not. The good thing about director Josef Rusnak’s film ‘Beyond’ is that it this is competently produced, tightly directed and thanks to the presence of a solid cast, particularly John Voight who has been playing different variations of beaten down old men for the last twenty five years, the movie also delivers on some good performances. Because of these positives ‘Beyond’ makes for a good watch. The pace is even, the story is perfunctory, and the mystery we are dealing with is well concealed even though the filmmakers probably dealt from the bottom of the deck a bit when coming to their eventual conclusion. All that being said, and recognizing that ‘Beyond’ isn’t a bad movie by any stretch, it all feels so familiar. The movie travels down a very well worn path and no point does it make any sharp turns or detour off of this path, with every beat and most of the plot points playing out just as you would expect them to. But we’re not complaining, even though it might sound like we are just a little bit. 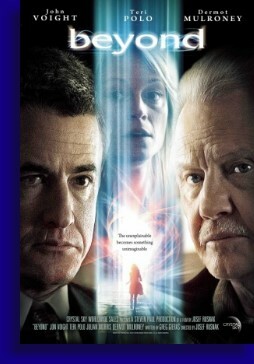 ‘Beyond’ was an effective thriller, able to effectively straddle the line between the supernatural stuff and regular old police leg work, and John Voight, not surprisingly was very good in this film. ‘Beyond’ just paints by the numbers to a fault. And to be honest with you, I don’t know if there’s anything more you can truly do to spice up this genre at this point.